Recently we received several phone calls about control of winter annual weeds in the fall and how temperature and frost might affect herbicide efficacy. As fall temperatures will continue to drop, it is important for growers to decide as soon as possible about applying herbicides this fall. Fall herbicide application is not needed in each field. Herbicide timing to achieve the most effective control varies according to the weed species present. That's why field scouting is important before you decide about herbicide application. For example, if you see a lot of marestail, a fall herbicide application is needed. Marestail is a significant problem weed in Nebraska. Most marestail in Nebraska is resistant to glyphosate and the ALS group of herbicides (Classic®, Permit®, Pursuit®, and Raptor®) and is challenging to control with only a glyphosate burndown program. A recent survey reported that more than 2 million acres in Nebraska is infested with herbicide-resistant marestail. Marestail can emerge in the fall and in the spring; however, most marestail in Nebraska is fall emerging and more effectively controlled in the fall when it's in a seedling stage. Tank-mixing a residual herbicide with a burndown product will improve marestail control because the residual activity will control marestail emerging after herbicide application. Corn and soybean harvests were late this year due to rains in September and October and fall burndown applications were delayed in much of the state. With seasonally low air temperatures at this time, growers have asked about how temperature will affect the efficacy of fall burndown herbicide applications. The likelihood of reduced weed control due to cool temperatures will vary depending on the target weed, herbicide, and rate of application. The ideal temperature for applying most post-emergence herbicides is between 65°F and 85°F; however, that window is not always practical with other fall practices. Herbicides can be applied at temperatures of 40°F to 60°F, but weeds may be killed slowly. When the temperature is below 60°F, absorption of herbicides such as glyphosate and translocation of herbicides such as 2,4-D are lower compared with applications at higher temperature; therefore, they act slowly. Herbicides applied in the fall will NOT provide control of summer annual weeds such as common waterhemp or palmer amaranth because they do not emerge until May. When the temperature is below 40°F for an extended time after burndown herbicide application, weed control will most likely be reduced, specifically for a systemic burndown herbicide such as glyphosate. Additionally, weed control may be reduced under cloudy conditions following an initial temperature drop below 40°F. With late-fall herbicide applications be sure to add labeled adjuvants to improve herbicide efficacy. For example, if you are planning to apply 2,4-D, add crop oil concentrates at 1% v/v (1 gallon per 100-gallon spray solution) or non-ionic surfactant at 0.25% v/v (1 quart per 100-gallon spray solution). Spray volume should be 15 gallons per acre for better coverage when a dense weed population is present. Actively growing weeds are the key to achieving good control, whatever herbicide you use. When weeds are under stress, herbicide efficacy drops. Frosts of less than 25°F usually cause leaf damage to annual plants, making them poor targets for herbicide applications; however, winter annual weeds may tolerate usually a frost up to 20°F and continue growing when conditions improve, with little tissue damage. Symptoms of frost damage to leaves are a water-soaked appearance shortly after the frost. This is followed by a darkened or blackened appearance within a day or so, and then necrosis after a few days. After weeds experience frost active growth may not begin again for a few days. Growers should wait until new leaf tissue is produced, scout the field, and then consider applying herbicide. Generally, this would be when nighttime temperatures are 35°F or greater and daytime temperatures are at least 50°F for two consecutive days. Additionally, bright sunshine is needed for plants to recover. Figure 2. Marestail rosettes can be quite small in the fall and easily hidden by residue in no-till fields. Figure 4. 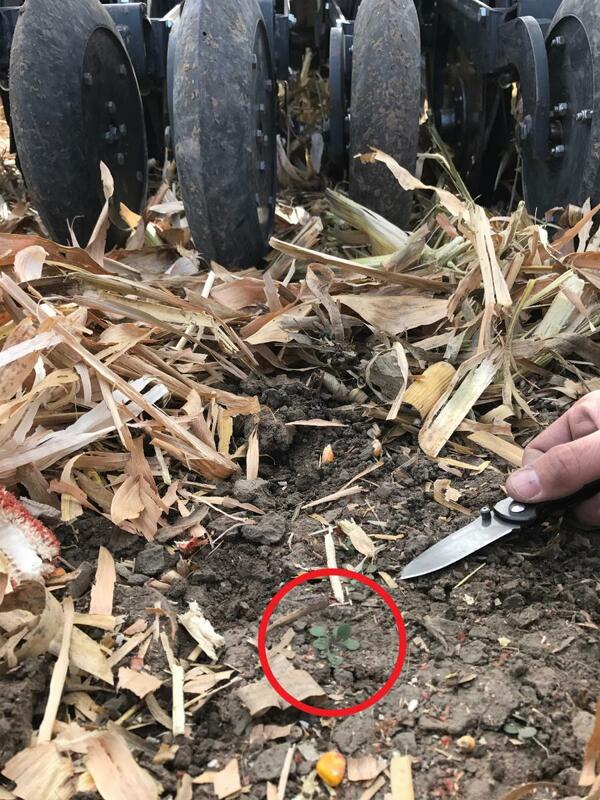 Certain winter annual weeds such as henbit may start emerging before corn harvest. This is especially true this year when harvest was delayed and there was enough moisture in the soil to support growth. Six winter annual weeds have been identified as alternate hosts to soybean cyst nematode (SCN): purple deadnettle (strong host), henbit (strong host), field pennycress (moderate host), shepherd’s-purse (weak host), small-flowered bittercress (weak host), and common chickweed (weak host). SCN can reproduce in the field on henbit and purple deadnettle. For more information, see this Purdue University Extension resource, Winter Annual Weeds and Soybean Cyst Nematode Management.